Instant Pot Chili Whole30 — Simple. Whole. Paleo. This might not be your family's chili, but this is mine. Feel free to adjust as you need, and change up the vegetables (as long as they're Whole30 approved). If you want the chili more meaty, I think this recipe could handle two pounds, but you may need to skim the oil off the end product. 1. Saute beef with avocado oil until cooked through, using the saute function on your Instant Pot. 2. Add vegetables, tomato sauce & paste, chili powder, salt and pepper. Mix so everything is combined. 4. Put on the lid (make sure the sealing valve is set to "pressure") and set the pressure manually for high pressure, 10 minute timer. 5. Let the pressure naturally release for about 10-12 minutes. If it's not done releasing pressure, manually release. 6. Stir, taste (and adjust seasonings) and enjoy! If you want your chili with a little more sauce, add more tomato sauce and adjust the seasonings. This recipe ended up making 4 x 2 cup servings of chili. Serve with a side of cauliflower rice and some kind of green vegetable. Yum! * Please note, I'm assuming you are checking all your ingredients for Whole30 compliance. ** use a smaller dice for your sweet potatoes than your onions and peppers. I prefer my sweet potatoes not mushy, so I use a half inch dice for all veggies. 6 cups equals about 1 small/medium onion, 2-3 bell peppers, half a bag of baby carrots, 1 x 8 ounce container mushrooms. *** portion the extra tomato paste into 1-2 tablespoon blobs and wrap individually with cling film, then plop into a plastic freezer bag/freezer safe container, and just remove what you need when you need it. A small can of tomato paste is about 6-7 tablespoons. 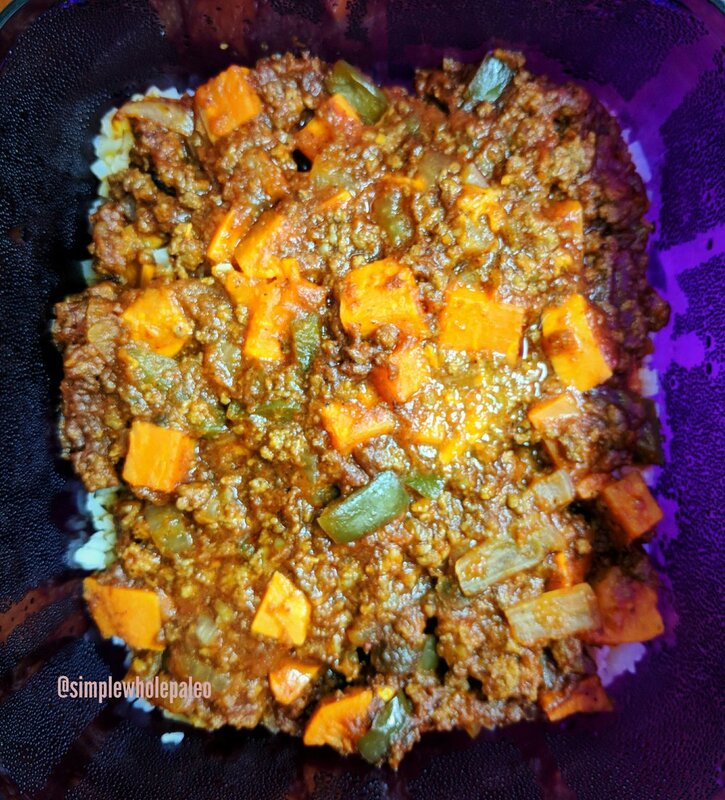 Chili with sweet potatoes, onions, celery, bell peppers. Chili with leek tops (the green parts), carrots, onions, mushrooms.